Avocado is rich in monounsaturated fats, vitamins and minerals. My son brought some fresh avocados from Netherlands. After using a few in various forms, made these healthy parathas. They were tasty and remained soft for a long time. Mix the flours and dry ingredients well. Add the avocado pulp and methi leaves. Mix thoroughly and form a dough. No need of water. Add oil and once again knead well. The moisture from the avocado and methi leaves are enough for binding. If it is too hard, add a few tsp of water. Rest for 20 minutes. Divide the dough into 10 equal parts and roll them into parathas. Heat a pan on medium flame and cook both sides of the parathas with oil. Serve with any pickle, curd or raita. 1. 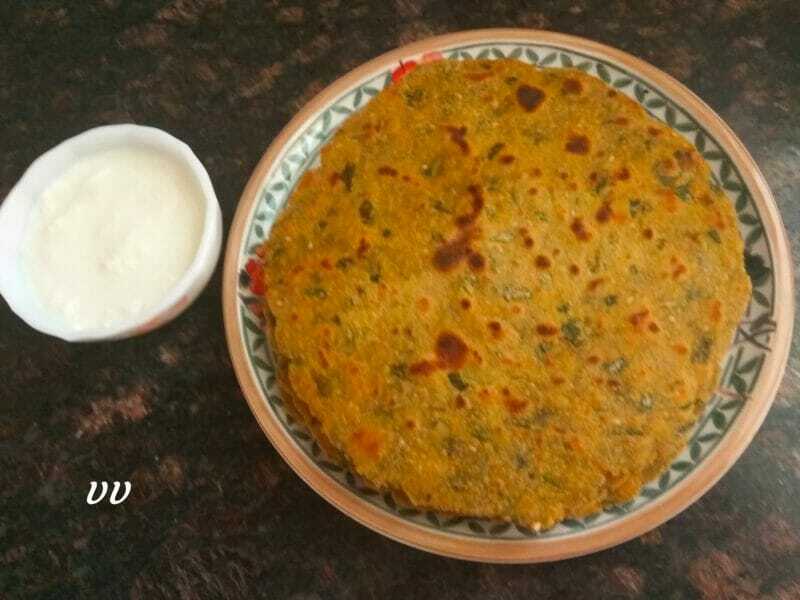 Jowar and Ragi flours can also be used in place of Bajra. 2. Make sure the leaves are washed, chopped and fairly dried before adding. 3. If the dough is too soggy, add some more flour and knead. There was an error in my earlier message. Instead of grating the avocado it was hearing…. Sorry for the typo. No issues! It happens with everyone. I tried this paratha yesterday as soon as I received the post. It simply tasted delicious. The only alteration in the recipe I had to make was hearing the avocado which was unripe and grinding it with green chilli and adding to the wheat+ragi flour. Other aspects were as per the recipe. This is a keeper of a recipe. Thank you VVji! Happy to get an immediate validation from you! Glad that you liked it. Thanks for sharing your experience.